Indonesia, former Netherlands East Indies, was a Dutch colony from 1816 until 1941, when it was occupied by the Japanese. Although Indonesia proclaimed itself an independent republic in 1945, the Dutch refused to recognise it until 1949. 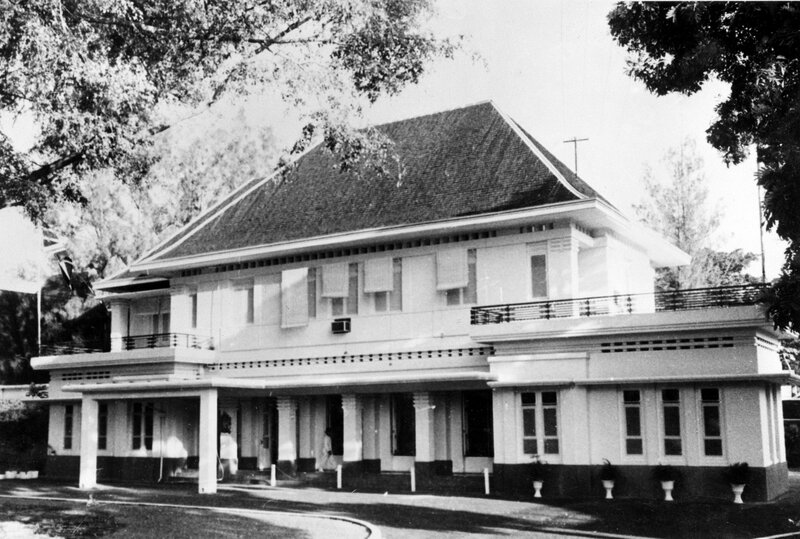 The first consul-general took up post in Batavia in 1913, and the first ambassador was appointed in 1950. 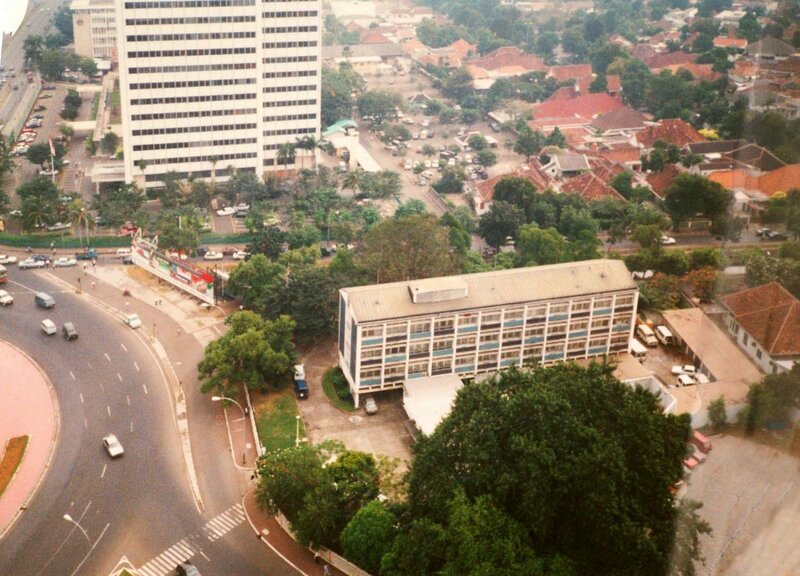 The name Batavia was changed to Djakarta in 1942 and to Jakarta in 1972. By 1926, successive consuls-general had become exasperated by the absence of any suitable property to rent. 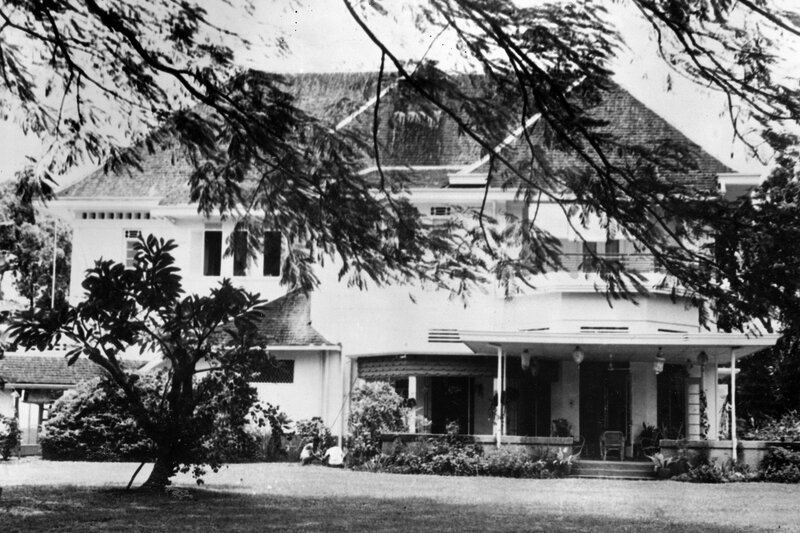 Eventually, a lease agreement was drawn up in October 1931 with a major Dutch insurance business, founded in 1859, NILLMIJ (Nederlandsch – Indische Levensverzekerings en Lijfrente Maatschappij) which would buy a building site in Menteng, on Nassau Boulevard (now Jalan Imam Bonjol), and build a house on it for consuls-general to occupy for thirty years from June 1932. 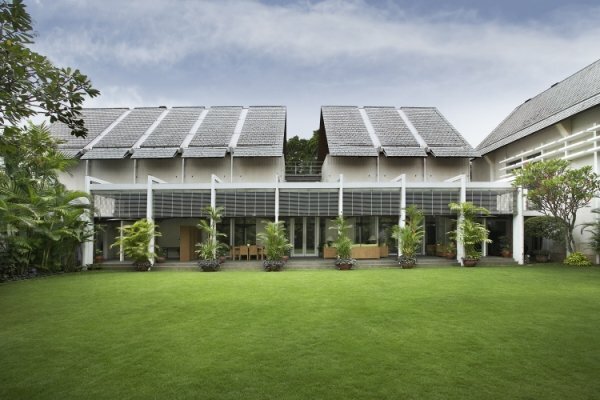 The design was by JFL Blankenberg, a respected local architect who built various large houses in Menteng, and the projected completion date was met with one month in hand. Architect Blankenberg’s residence proposal, 1931. 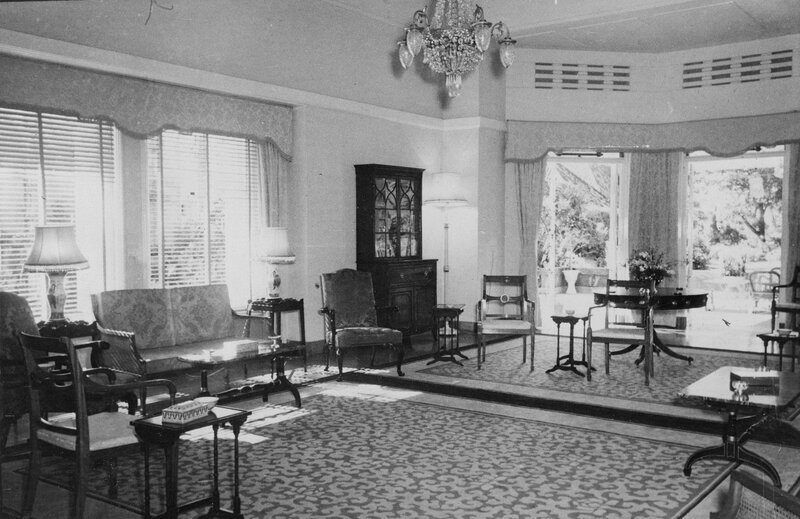 Part of the residence drawing room, 1932. Drawing room, from the garden door, 1964. 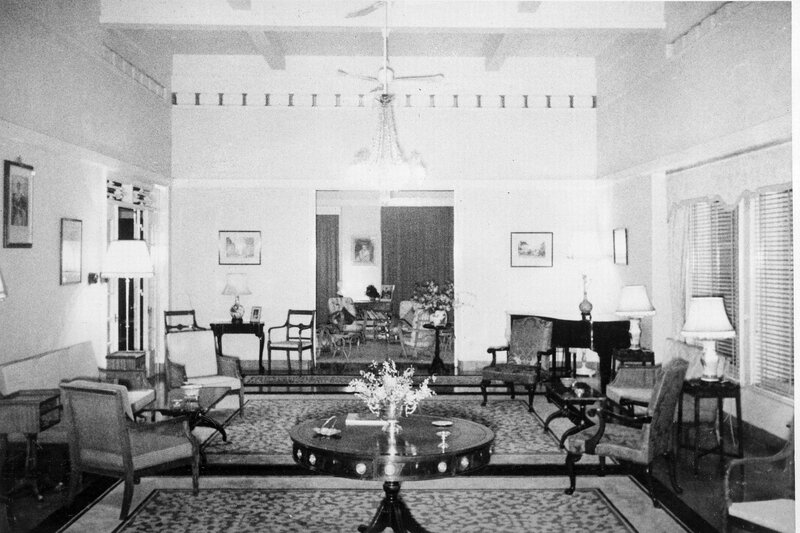 Drawing room, towards the garden door, 1964. No. 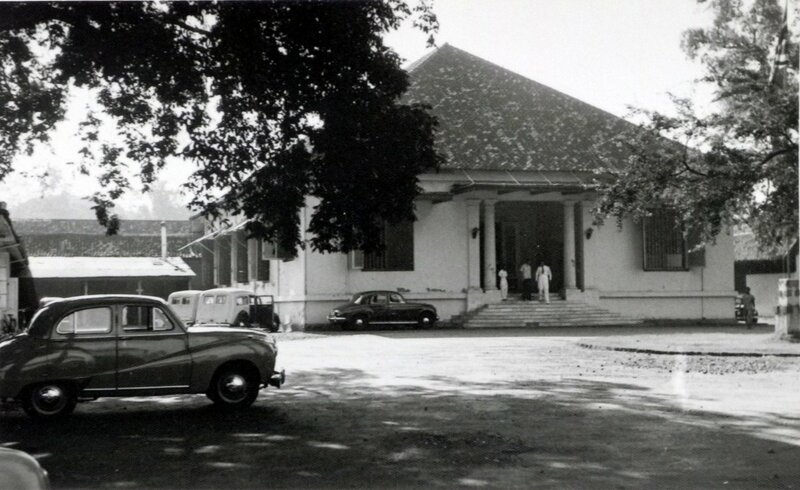 2 Imam Bonjol, leased for the head of chancery, 1955. 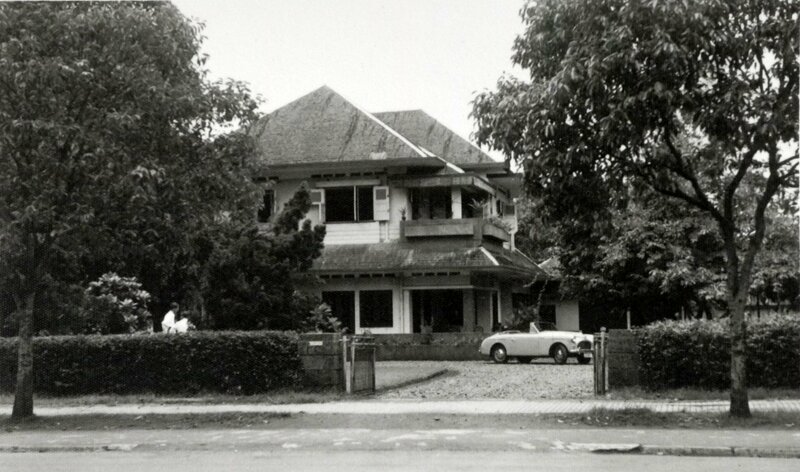 The landlord of the residence was instructed by the Indonesian government in the late 1970s not to renew the lease to the British because it wanted the house as a museum, to be called ‘The 1945 Indonesian Independence Proclamation Text Building’. Although the house had served as an excellent residence for nearly fifty years, the Foreign Office judged it inappropriate to contest the termination of the lease and made arrangements to leave. In the event, 1 Imam Bonjol lay vacant for quite a few years before the promised museum materialised. It remains in that use, as the Museum of the Declaration of Independence. 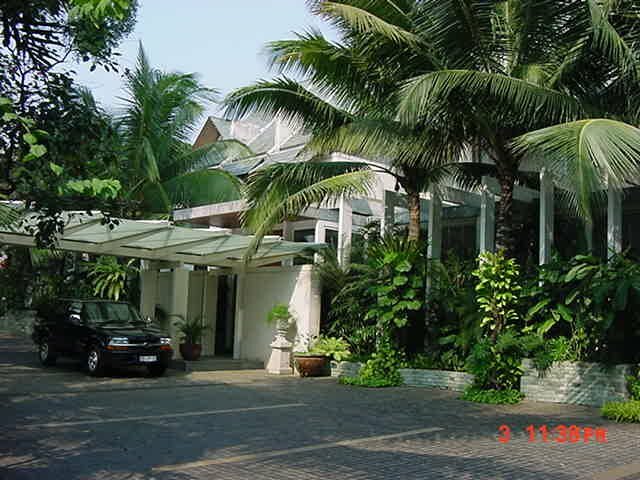 The search for an alternative residence alighted upon a fairly new house, built in 1975, at 105 Jalan Kemang Raya Selatan in Kemang, about six miles south of the city centre. It was bought in 1980 for £210,000, with ingoings costing a further £60,000: the 0.3 hectare site included a swimming pool but insufficient parking. It proved, however, a poor choice, mainly because of its distance from the centre and the time it took to drive through the congested traffic, narrow streets and, often, enormous puddles. Although it was agreed in principle in 1984 that it was no longer operationally acceptable and should be replaced, ambassadors continued to live there for another twelve years. The search for an alternative was extremely difficult and lengthy. Negotiations to acquire a house called Astra House failed at the last moment and attention instead turned in 1989 to seeking to purchase, through an intermediary, the 0.3 hectare site of the former North Korean Embassy at 72/74 Jalan Teuku Umar, back in Menteng, on which to build a new residence after demolishing the two small houses on the site. 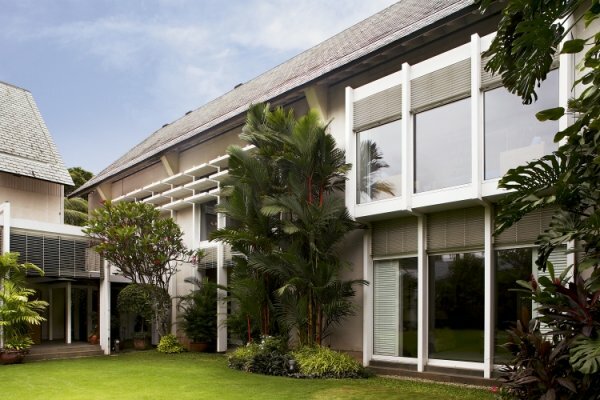 This acquisition was achieved in 1991 and the design of a new residence was commissioned from Denton Corker Marshall, the Australian architects of the recently completed Australian embassy in Jakarta. The new design had a first-rate diplomatic and architectural pedigree because the incumbent ambassador, Roger Carrick, had been the head of the FCO’s Overseas Estate Department in the mid-1980s and the head of the architects’ London office, Stephen Quinlan, had been a superintending architect in the same department. Together, they sought an innovative response to the modern requirements of a residence and applied it to the tight and over-looked new site. The planning authority required, because the site was in a conservation area, that the former existence of two houses on the site should be acknowledged in the new design. Partly as a result, the design separated the public and private functions of the residence into two blocks. The drawing and dining rooms, on either side of an entrance hall, were in a one-storey representational block which gave on to a central lawn (part of which could be shaded for big occasions by a retractable fabric cover). And the family and guest quarters were in a separate two-storey wing to one side. The servants’ quarters and ancillary functions were in a lesser wing to the other side. 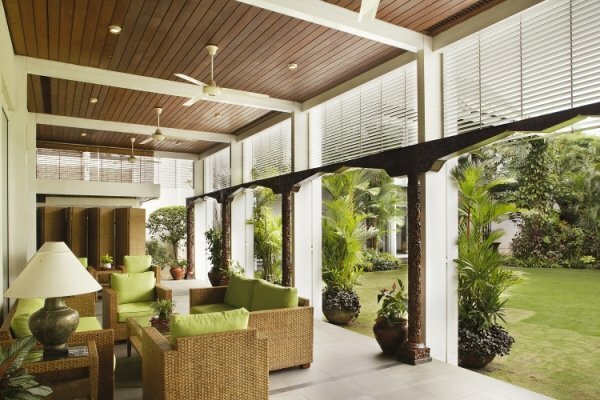 The enclosure of the central lawn was completed by a wall that screened the swimming pool at the back of the site. Centre block, from the garden, with drawing room at right and dining room at left, 1990s. The reception rooms’ terrace, 1990s. 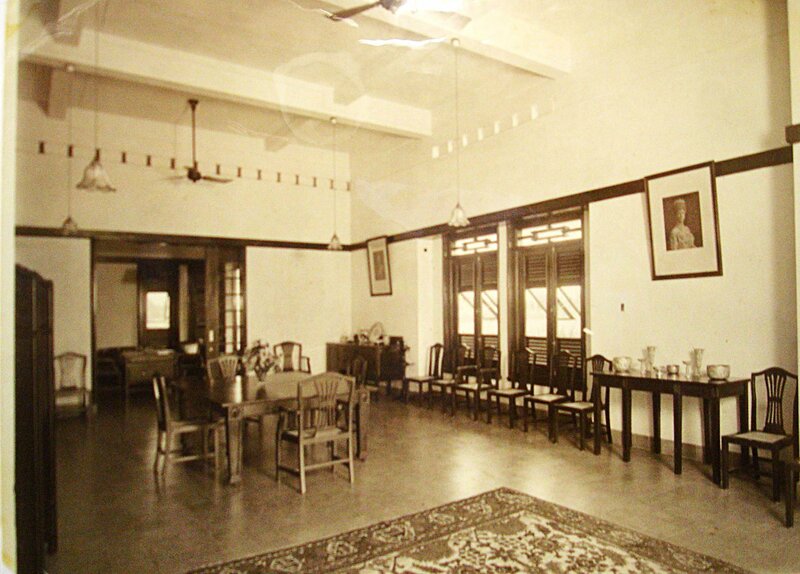 The pre-Second World War offices were in a small building leased from the Standard Vacuum Oil Company, and the post-war ones in a property at 29 Jalan Majapahit. 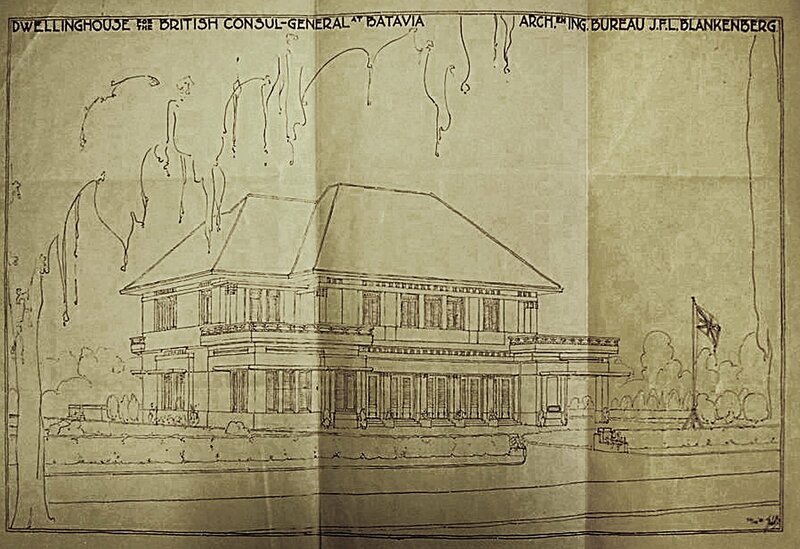 By the late 1940s, with full independence on the horizon, new accommodation was clearly needed and the intention was to seek from the Indonesians a site for a compound on which to build both offices and staff accommodation. Considering sites with the Municipality and drawing up the precise requirements occupied the early 1950s. 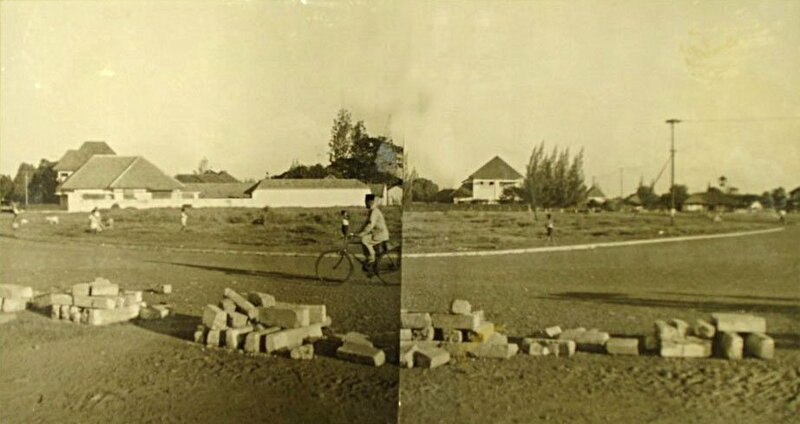 By 1954, Site No 839 on Jalan Madura and the continuation of Jalan Imam Bonjol (on what became Thamrin Circle) had been identified as the most suitable. A draft lease agreement was drawn up, to which the intended plans for a building to be completed within two years would be attached. At that juncture, the Australians, who were expecting to build on an adjacent site and to share the infrastructure costs, pulled out of the arrangement. The British lease was signed at the end of 1954, to run for fifty years from 1955, with an option to extend for 25 years. But uncertainties continued for several more years: the official exchange rate was only about 40% of the unofficial one, which would drive up the sterling costs; efforts were made to alter the the lease to an indefinite term and to extend the period for building; and, although changed planning regulations permitted a higher building than planned, it was decided not to re-design the scheme. Agreements were eventually reached, and tenders were invited in January 1960: of seven firms approached, four declined to tender and two insisted on only a cost plus basis, leaving the impossible position of just one tenderer. 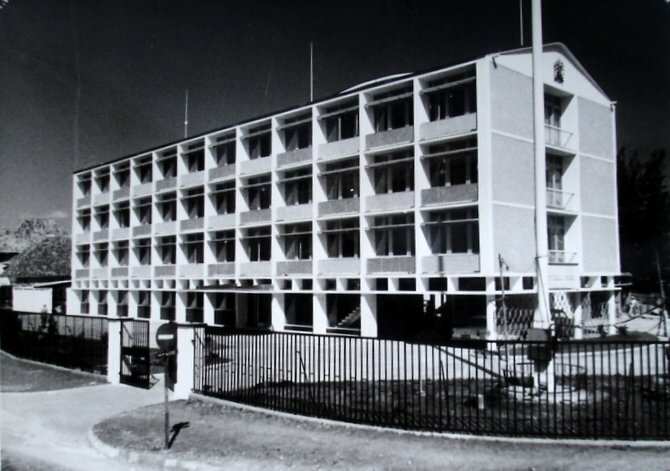 The Ministry of Works therefore decided to build the offices with directly employed labour in the expectation of significantly lower costs and of sufficient speed to offer more hope of completion before the Asian Games in 1962. Treasury agreed in April 1960, within a maximum cost of £250,000. The foundation stone was laid on 1 December 1960 by Lady Fry, the ambassador’s wife, and the opening ceremony was on 2 August 1962 [by whom?]. 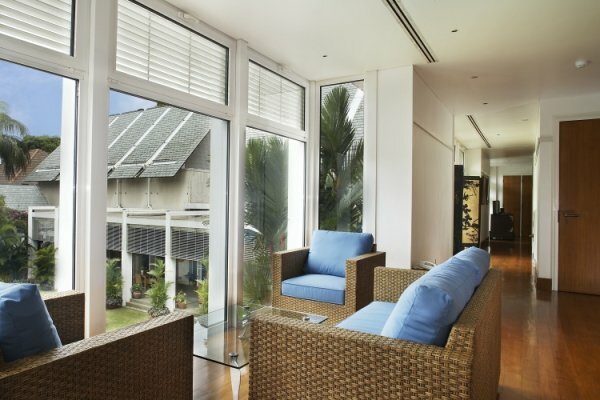 The final cost was about £180,000 and the new address was Jalan Thamrin 75. The lease terms had by then been converted to indefinite right of use, known locally as hak pakai. Barely a year later, in September 1963, the building was severely damaged by fire during riots. Most of the offices moved into 1 Imam Bonjol, and hutments that were quickly erected in its garden, and some into leased premises. [Did ambassador go to live in 2?] Reconstruction started in 1964 but was stopped the following year as bilateral relations deteriorated and no agreement could be reached on reparation costs. 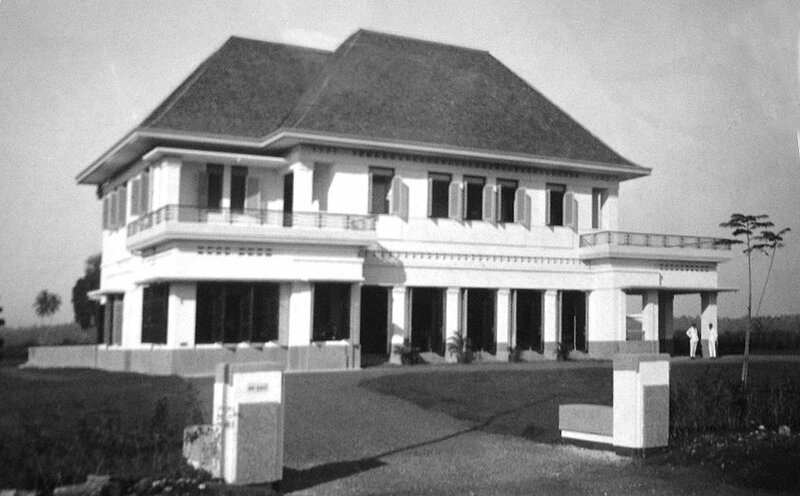 Work resumed in 1967, to the original design and at Indonesian expense, and the offices were re-occupied on 3 June 1968. By the late 1980s, they were becoming pretty outmoded, both locationally and structurally. Tall buildings encircled Thamrin Circle, in comparison with which the embassy looked like a rabbit hutch. And the building itself, if it was to be retained, was in sore need of a thorough refurbishment (which it received in the early 1990s). Various development ideas were pursued through the 1980s and 1990s, including with Deutsche Bank who were about to develop their adjacent site, but foundered on the uncertainties of the hak pakai and on entrenched local interests. Offices. 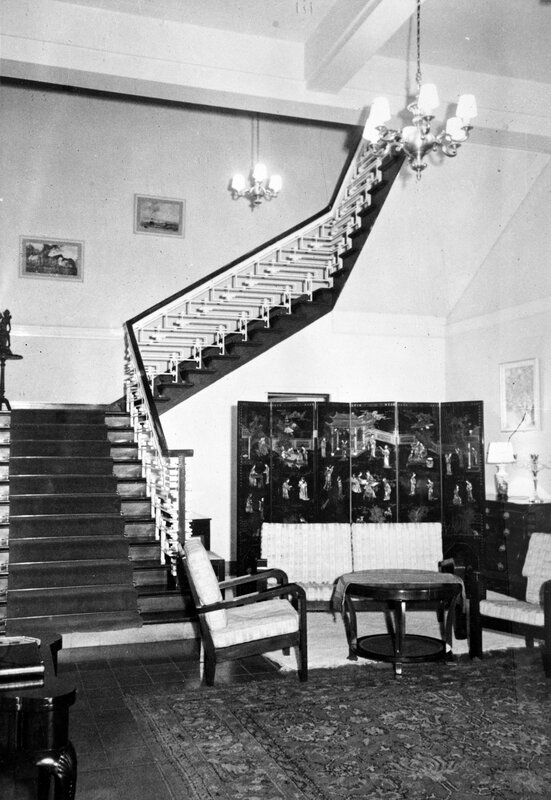 at 29 Jalan Majapahit, 1955. The site for new offices at Thamrin Circle, 1953. 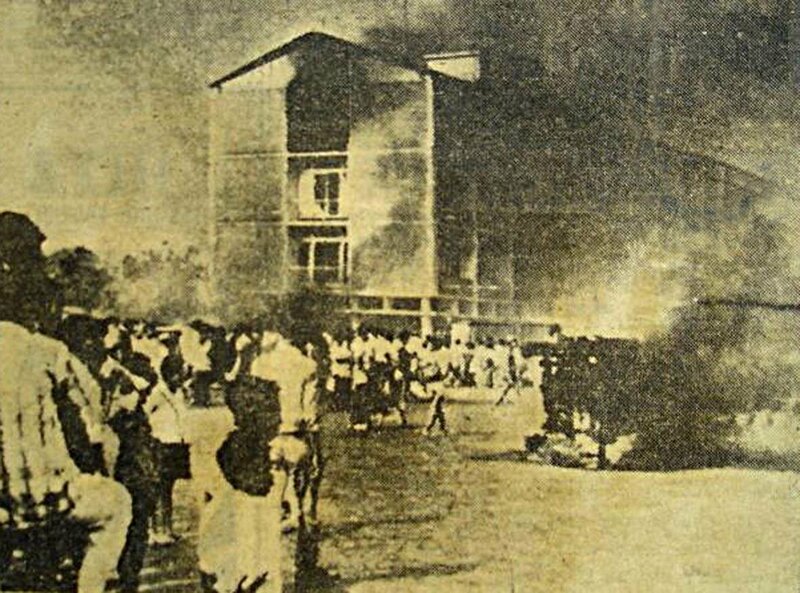 Offices ablaze, 15 November 1963.